60 Eagles, 39 Bulldogs, and Kangaroos in Minnesota? March Madness and the insipidness of college basketball nicknames. No sports event in this country engages as many people over an extended period of time as the NCAA basketball tournament, better known as March Madness. This year, 68 teams of enthusiastic college kids have a shot at the championship. Fewer than half of the teams have a realistic shot, which creates the possibility of a tremendous upset. Perhaps, finally, a 15th-seeded team will make it to the Final Four. Maybe, for the first time, a 16th-seeded team, which always draws a number one seed for its first opponent, will advance to round two. 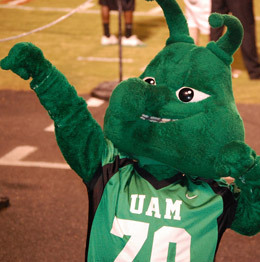 On the not-quite-animal/not-quite-human mascots of professional sports. Based on the headlines I’ve skimmed, the World Series spurs a lot of questions — questions I don’t really care about involving starters and lineups and blah blah blah. 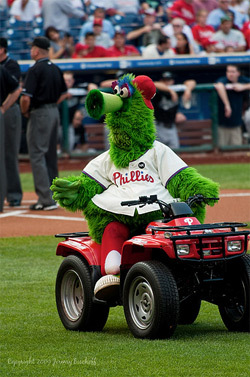 I’ve got a question: How about that Philly Phanatic? !